Not at the World Championships in Paris this year. That was Fukuda’s third time officiating at this pinnacle event, previously working the Worlds in Tokyo last year and Rotterdam in 2009. Something must have clicked. 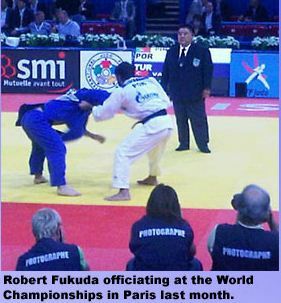 Fukuda obtained his national certification in ‘93, within a few years moved to the small town of Fruitland, Idaho, but remained on track to earn his Pan American regional certification in ’97, his International Judo Federation B-certification in ’99 and his A-certification in 2004. Also after moving to Fruitland, he started the Western Idaho Judo Institute, a prestigious dojo in the judo-heavy Northwest – click HERE for the website. That Fukuda would someday officiate at the World Championships “was not even a thought at the start, but I kept resetting my goals higher and higher.” He also says that he received tremendous support from his wife and family, pointing specifically to the financial sacrifice that such a climb requires. This entry was posted on September 28, 2011 at 9:42 pm and is filed under Judo News. You can follow any responses to this entry through the RSS 2.0 feed. You can leave a response, or trackback from your own site.